During my stay in Arizona, I wanted to explore inspirational tech startup stories in the Phoenix area. 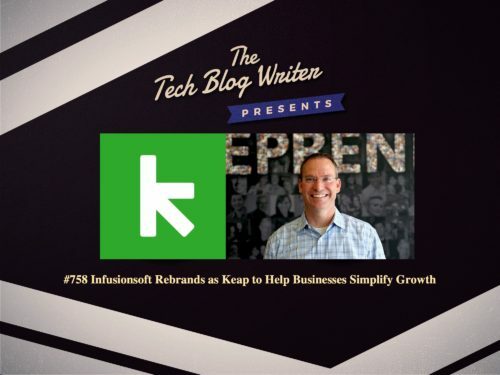 Infusionsoft recently announced that it rebranded the company as Keap. The new name represents the very essence of the grit and passion small businesses put in each day to keep going, keep serving and keep growing. With the rebrand, comes the launch of a new product, also named Keap, the industry’s first smart client management software built specifically for small businesses in the home, personal and professional service industries. For 17 years Infusionsoft had led the market as the pioneer of CRM and marketing automation software for small businesses. The Keap product launch and company rebrand is a signal the company is expanding to serve a new market. I wanted to learn more about the tech startup story behind the company that pioneered the CRM and marketing automation category for small business and today serves more than 200,000 users globally with its Infusionsoft and Keap products. I visited the their headquarters in Chandler, Arizona to talk with Clate Mask, the CEO and Co-Founder of Keap. Clate is also the author of Conquer the Chaos: How to Grow a Successful Small Business Without Going Crazy’, a New York Times bestseller which focuses on balancing personal and work life, will becoming successful as a budding entrepreneur. We talk about the inspirational tech startup story that began as an what they called an Everest mission and developed into a Mars mission to simplify growth for millions of small businesses. Clate shares the highs and lows of building a company and also the thriving tech scene in Phoenix Arizona.